Grizzly bears in the Cabinet-Yaak Ecosystem are struggling. Tucked into the northwest corner of the state, the Cabinet-Yaak does not benefit from the conservation strongholds of a national park or large wilderness area. U.S. Highway 2 follows the Kootenai River through the middle of the ecosystem, a geographic waistline that splits the area in two, separating the Cabinet and Purcell mountain ranges. Recent studies estimate just 25 bears on either side of the divide. Connecting the Cabinet-Yaak’s grizzlies, and its other threatened wildlife, marks the goal of our ambitious Wild River Project. U.S. Fish and Wildlife Service biologists pinpointed this place as the right one for private-land conservation, and now we’re taking the reins. Weber Gulch represents a unique strategic project for Vital Ground. In 2016, we acquired a crucial private inholding within Montana’s Lolo National Forest, and now we’re in the process of turning the land over to public hands. That’s because the Cube Iron-Silcox Roadless Area, a key habitat buffer at the southern edge of the Cabinet-Yaak, surrounds the parcel. 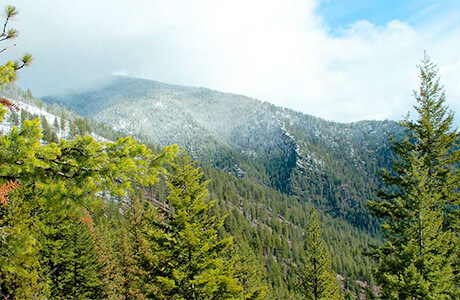 And beyond disrupting wildlife connectivity, private development of the property—namely, road construction to it—would have taxed the Forest Service hugely, requiring many hours of federal oversight and necessitating road closures elsewhere in the grizzly bear recovery zone in order to maintain density requirements for the protected area. The effort to create Alvord Lake Community Forest out of a proposed lakeshore subdivision was the largest and most collaborative financial undertaking in Vital Ground’s history. And it’s a prime illustration of how our work to protect grizzly habitat carries benefits far beyond a single species. 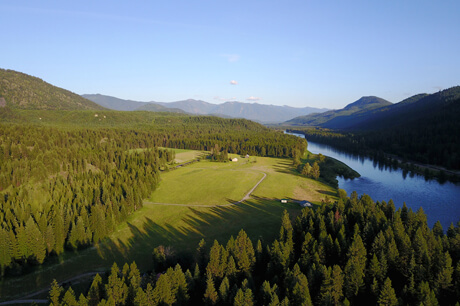 Two miles north of Troy, Montana, the sickle-shaped lake lies close enough to town that it’s a favorite fishing, boating and field trip spot for the 1,000-person community in the heart of the Cabinet-Yaak. But it’s much more, too. 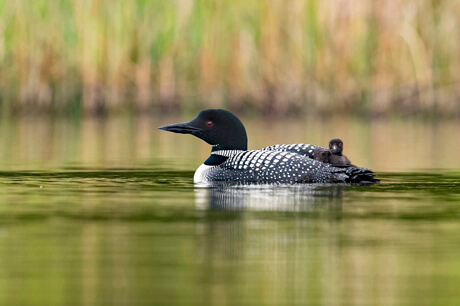 Alvord’s water provides one of the state’s few nesting sites for common loons, its mid-elevation shoreline serves moose and elk as favored winter range, and its setting on the southern edge of the Purcell Mountains—a range that stretches north into vast Canadian wild lands—helps connect sensitive grizzlies, Canada lynx and wolverines with habitat cores farther south in the Cabinet and Bitterroot ranges. 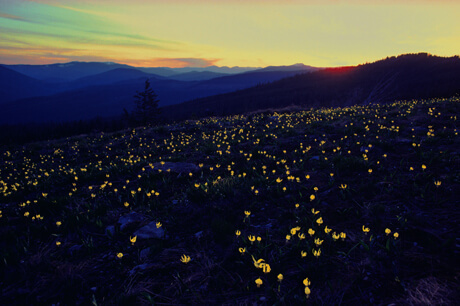 Many have called the Yaak Valley of Montana’s northwest corner the wildest place left in the Lower 48. Douglas and Marcia Lee Berg, and their grandson Karl, knew it to be true from observing the many sensitive species—grizzly bears, Canada lynx, wolverines, bull trout—on or near their family property at the confluence of the Yaak River and Meadow Creek. It was this appreciation of the region’s precious habitat that prompted the Berg family to generously donate a conservation easement to Vital Ground in March 2015. Filled with aspen groves and mature western red cedars, the now-protected land provides prime forest and riparian habitat in the middle of the Cabinet-Yaak Grizzly Bear Recovery Zone. Its permanent conservation under the easement will create a stable link between large surrounding tracts of national forest lands. Yaak Mountain represented a huge step forward in Vital Ground’s work to aid grizzly recovery in the Cabinet-Yaak. As our first fee-title acquisition in the ecosystem, the purchase cemented our commitment to seeing the region’s embattled population of 50 or so grizzlies establish greater resiliency through genetic linkage with larger populations. 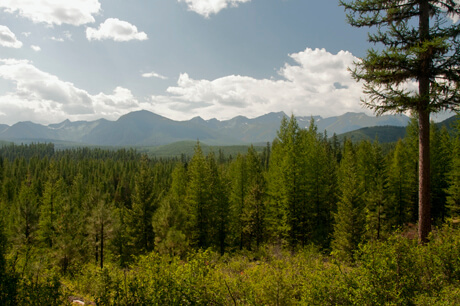 Two miles northwest of Troy, Montana, the forested and meadow-strewn parcel establishes a bulwark of protection from U.S. Highway 2 north into the Purcell Mountains. Now, six years later, it combines with our Wild River Project—which lies adjacent on the other side of the highway—to complete a critical corridor bridging the Kootenai Valley and connecting the Purcells with the Cabinet Range to the south. Boundary County in Idaho doesn’t just feature borders with both Montana and British Columbia. It also marks the western edge of the Cabinet-Yaak Ecosystem. 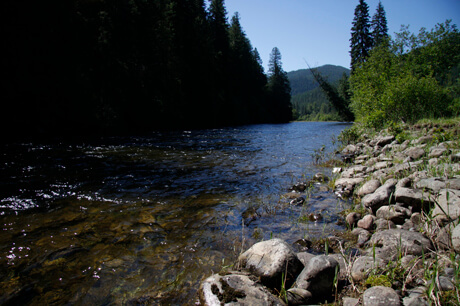 Within this remote rural area, the Curley Creek Valley hosts lush cedar-lined wetlands, precious timberland and idyllic habitat for grizzly bears and other sensitive species ranging from gray wolves to Canada lynx to bull trout. Naturally, then, we were eager to join forces with landowners Sam and Carolyn Testa, who generously donated conservation easements on their adjoining 80- and 30-acre properties in the valley. These easements build on nearby conservation lands protected through the Natural Resources Conservation Service’s Wetlands Reserve Program and Nature Conservancy of Idaho easements. Together, we’ve helped solidify buffer habitat on the edge of the Cabinet-Yaak, an important step toward connecting its grizzlies with those farther west in the neighboring Selkirk Ecosystem. Our largest conservation easement project was also a landmark collaboration with the U.S. Forest Service’s Forest Legacy Program. A decade later, the Clifty View Foothills forestland remains critical habitat for grizzlies and other wildlife in the West Cabinet Mountains. Lying just west of the Idaho-Montana border and along the edge of the federally-designated Cabinet-Yaak Grizzly Bear Recovery Zone, Clifty View has seen grizzlies denning within two miles of the property, making it critical conservation land as development pressure increases in the Idaho Panhandle. Our partnership with the Merrifield family, owners of Clifty View Nursery, ensures that the land will be managed to maximize its wildlife habitat value while continuing to bear a sustainable timber harvest. This combination qualified it for the Forest Legacy Program, a competitive federal fund that supports conservation efforts on working timberlands. 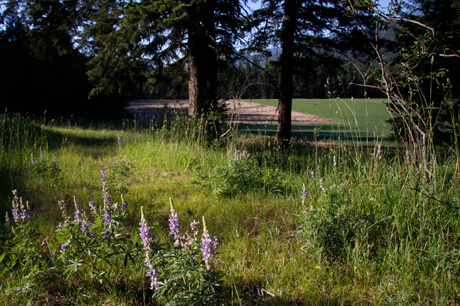 Partnering with the Forest Service and the Idaho Department of Lands, we helped craft a conservation easement that is held by the state of Idaho and monitored by Vital Ground. 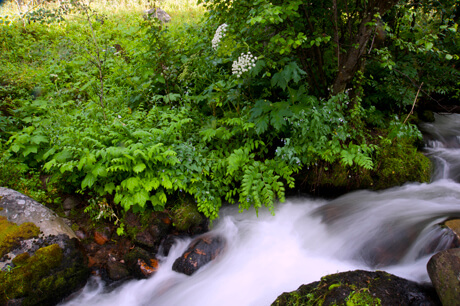 It may only span 87 acres, but the Kidd Creek Property in southern British Columbia is undoubtedly one of the “Right Places” for conservation—a small chunk of land that, once protected as habitat, benefits wildlife across a much larger landscape. That’s because the property’s northern boundary abuts Highway 3, an east-west thoroughfare across Southern B.C. that significantly fragments wildlife habitat. But biologists identified the Kidd Creek location as one of the few spots where grizzly bears regularly cross the highway, inspiring us to join the effort to conserve the corridor. In early 2007, we helped the Yellowstone to Yukon Conservation Initiative purchase an easement for the property, while The Nature Trust of British Columbia completed its fee-title purchase. Now, this habitat markedly improves the odds that bears who cross the big road will continue traveling south through the Purcell Mountains and reach the Cabinet-Yaak Ecosystem and the other side of the U.S.-Canada border. There, they can bring much-needed genetic diversity to a small and isolated population of grizzlies.